Now offering FREE, NO OBLIGATION Inspections! Our highly skilled and certified technicians are trained to identify and effectively treat hundreds of problem insects, spiders, rodents and other common pests while using leading edge technology and the most stringent safety precautions. Ridders Pest Control is a locally owned company providing protection from unwanted pests in Central Indiana. 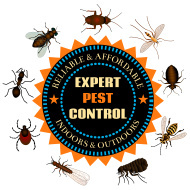 Our certified staff will work directly with you to provide pest control that fits your needs. Your safety and happiness is our goal in solving pest problems and preventing future ones. When do-it-yourself fails, call Ridders Pest Control and get a quote for protection from pests such as ants, rodents, roaches, bed bugs and more. Ridders Pest Control, Frankfort Indiana is a local, family-owned pest control Frankfort business whose goal is to provide the best, prompt and effective pest solutions to homes and businesses in Frankfort, Lafayette, Lebanon, Westfield, and surrounding areas of central Indiana. When you need just a one-time service or protection from pests year-round, Ridders Pest Control is dedicated to providing complete satisfaction. Whether it's bed bugs, ants, roaches, or wasps, we have the experience and know-how to help you eliminate pests and have peace of mind. For quality pest control at affordable prices call Ridders Pest Control of Frankfort, Indiana. With all of our plans, you are free to CANCEL future services AT ANY TIME. There are NO SERVICE CONTRACTS that you must sign with Ridders Pest Control. Your complete satisfaction is our goal because we appreciate and value your business and will do what it takes to make you happy and solve your pest problem. Ridders Pest Control is committed to "Integrated Pest Management". IPM focuses on prevention and involves using other methods of pest control in addition to pesticides. Our team is the experienced among pest control Frankfort and has years of experience to help you by eliminating pest harborages in and around your property and sealing or repairing areas where pests are likely to enter. Sealing and repairing also give you the extra benefit of weatherization and will save you money in the future on utilities and property maintenance. You save energy and reduce moisture problems. With Integrated Pest Management, Ridders Pest Control will help you to reduce pests, reduce pesticide applications, and save money. Our company started in Frankfort, Indiana because of the lack of a local pest control company in Frankfort or anywhere in Clinton County. At that time, bed bugs were becoming more and more common in the area and there was no one locally to call on. One of the owners of Ridders Pest Control began his career in pest control in 1986 working for a large pest control company in central Illinois. His experience was with monthly, bi-monthly, and weekly commercial accounts including apartment buildings, restaurants, offices, factories, a hospital, retail stores, warehouses, farm buildings, grain elevators, grocery stores, etc. With this background and experience the owners felt like they could provide a much needed service in the Frankfort, Indiana area. Since that time, the bed bug problem has continued to grow and Ridders Pest Control specializes in bed bug remediation. You can trust Ridders to solve your pest problem quickly and cost effectively. We are locally owned and operated, insured, and government licensed.